An app created by Georgetown students to connect women in university computer science programs took first prize in the gender equality track at this year’s 2019 Hoya Hacks competition. Hoya Hacks is an annual 36-hour “hackathon” during which students from Georgetown and other universities compete to use technology to advance solutions to national and global challenges. The gender equality track is part of Georgetown’s commitments to HeForShe, a UN movement to engage men – and people of all genders – and unite them in the quest for gender equality. This year’s hackathon focused on hacking for social impact. In addition to gender equality, students worked to create innovative products in fields such as digital forensics, equity and access, cybersecurity, and social innovation. “Using this theme as a base for Hoya Hacks allows our students to think about formulating technology in the service of others, which is truly an idea in tech we want more of,” says Joshua Meredith, assistant dean for analytics, technology, and security programs at the School of Continuing Studies. 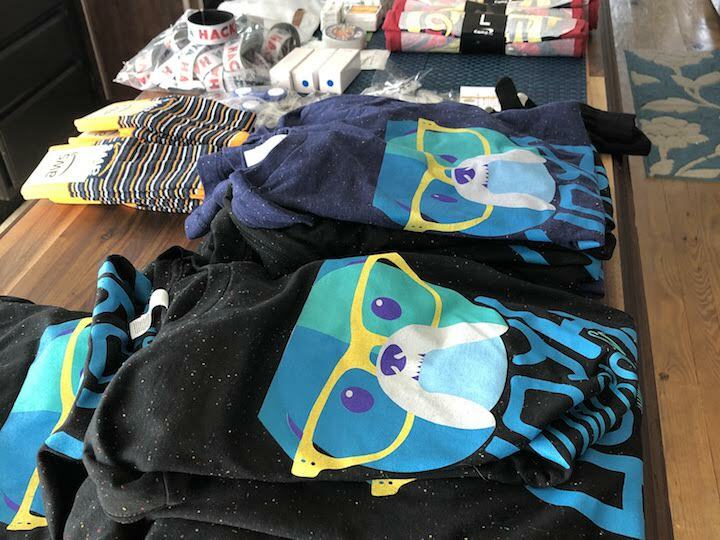 T-shirts and small prizes from Hoya Hacks 2019. Students participating in the gender track were challenged to think about how HeForShe supporters can work with women to create meaningful change in their communities. The winning team developed a social matching app that pairs women in computer science departments who have similar personal and professional interests. The Georgetown students who created the app hope to help women connect across age groups and within large lectures. The other students on the winning team were Kathryn Li (C’19), Narae Lee (C’20), and John Li (National University of Taiwan). Georgetown President John J. DeGioia is one of just 10 HeForShe University IMPACT Champions worldwide – and one of only two in the United States. In addition to their institutional commitments to gender equality, champions are asked to hold an annual Ideathon with their campus community. The university has integrated the Ideathon into Hoya Hacks through the gender track to actively incorporate technology in the solutions the Ideathons generate. For the past three years, the HeForShe Ideathons have focused on reducing gender-based violence.